With everything happening in the world, VR makes a lot of sense right now. Not purely as a form of escapism, but a moment of reprieve where we can take a break and feel like a kid experiencing something fun for the first time. On the site this week, we discussed how to build a budget PC for VR in case you don't want to spend over a grand to use a high-end headset. HTC also hasn't released official numbers for how many HTC Vive units its sold, but there's speculation the number is around 80,000. After using Oculus Rift and Vive for some time now, we've updated our thoughts on the best VR headsets out now, and weighed in further on Oculus Rift versus PlayStation VR. And finally, after finding out how Derren Brown's VR Ghost Train works, we went to Thorpe Park and tried the train ourselves. Here's everything else happening in the world of VR. It looks like Google is working on a way to let you browse every part of the internet in VR. It makes sense since the company is focusing a lot of time on releasing its Daydream headset and platform. Taking it one step further means creating way to explore the Chrome browser in VR without having to take the headset off. If you have a Samsung Gear VR, get ready for a whole lot of Rio Olympics. The summer games will be available to watch in VR only through the Gear headsets and regular TV subscriptions of course. But why do the latter when you can pretend you're actually there? Deadmau5 has teamed up with Absolut Vodka to make a VR video game. And you can pre-order a $14.95 Cardboard headset to go along with it. You can check out the trailer and decide on 27 August if you want to try it out on Android or iOS. Apparently a Dutch site that covers Samsung rumors has caught wind of an imminent next-gen Gear VR headset. For now, it seems like there's suspicious model numbers and not much else. Considering the Gear VR is still young, we aren't sure that another is on the way so soon - we'll report any IFA news as it happens, though. We've all played the fruit slicing game on mobile devices at one point or another, and now we can in VR. 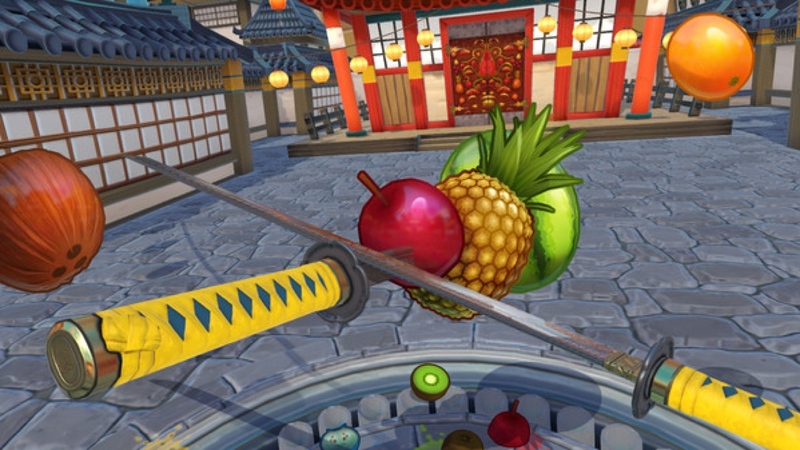 Though it's only an Early Access game on Steam, Fruit Ninja is still an enticing purchase. The gist is what you'd expect: Use the Vive controllers as swords to destroy the fruit (or actually, make really clean cuts). There are three modes, Arcade, Classic and Zen to choose from as well so you don't get bored. Fruit Ninja is available on Steam Early Access for $11.99 until 14 July when it will be up to its $14.99 price. This is probably the weirdest video we'll post for FOV. Ostrich racing in 360-degree video. Because why not? It's not a first person perspective, but you still get to watch people galloping around on giant birds.